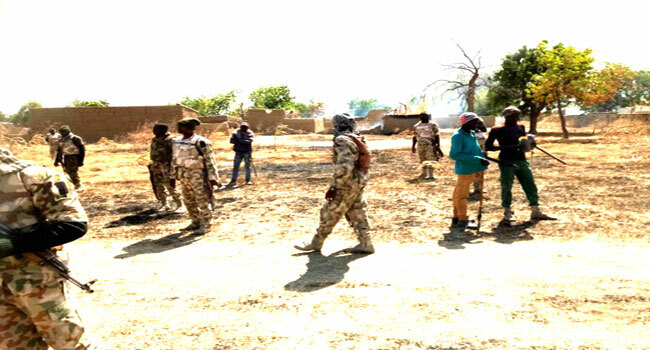 The ongoing war against insurgency got a boost on Friday night as troops of Operation Lafiya Dole on a fighting patrol killed four Boko Haram insurgents in an ambush in Malumti area of Borno State. A statement by the Deputy Director of Public Relations, Theatre Command Operation Lafiya Dole, Colonel Onyema Nwachukwu, on Saturday said the insurgents met their Waterloo while searching for food and logistics. “The insurgents who had been routed out of the Sambisa by troops in Operation Deep Punch II were rummaging for food and logistics when they met their Waterloo,” he said. Nwachukwu explained that the soldiers were able to recover a Toyota Land Cruiser, one AK 47 Rifle, 15 Rounds of 7.62 mm ammunition, one Magazine and 47 Jerrycans of Premium Motor Spirit.